Seven years is a long time to wait between albums. But then Southern gospel star Candy Christmas, previously known as Candy Hemphill, has good reasons for the long delay before releasing her 'On The Other Side' album. "The way I think of it is that in Michigan, when they're building a new car model, they shut down all assembly lines and send everyone home. They don't just start adding new parts to an old model. They shut down and retool. God has been retooling me. I knew in my heart I didn't have anything pertinent to say until now. Rather than just crank out a project, I wanted to do something fresh and different and let my music reflect what's going on in my life." What has been going on in Candy's life is The Bridge Ministry - named for its location under the Jefferson Bridge in Nashville. The Bridge is now a thriving ministry which includes a weekly church service on Tuesday nights to feed and preach to up to 500 homeless people. Other local churches and ministries (including the Salvation Army) also reach out to these homeless. Some of those organizations use The Bridge's 20,000 square-foot warehouse - a resource hub for nonprofits - which is stocked with dry goods, toiletries and coats to pass out to the needy for the winter. The ministry began in 2004 after Candy took a pot of jambalaya to a group of homeless people on a visit with a local pastor. She was battling depression at the time. She told Christianity Today, "I had lost my appetite. I couldn't eat. I was 100 pounds. Then when I got there [to the bridge], it was like something came alive in me that was dead - something that was lacking." So she kept returning to the same spot, always a pot of jambalaya in hand. It eventually grew to a group of volunteers and ultimately a weekly worship service and ministry that functions much like a local church. 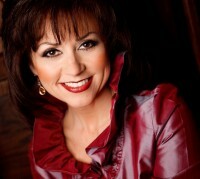 Born Carmel Hemphill in Bastrop, Louisiana in 1961, she was a third-generation member of Southern gospel royalty. The Happy Goodman Family were her grandparents while at the age of 13 Candy joined The Hemphills, the legendary family group founded by her parents Joel and LaBreeska Hemphill. Said Candy about her early years, "I was born into a record deal. It's just what I did. If I didn't join in, I would be home and the bus rolled on without me." 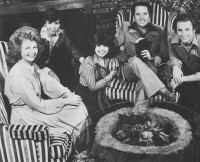 Candy travelled full-time with The Hemphills for 18 years during which time the group won six Dove Awards and Joel was nominated 10 times by GMA for Songwriter Of The Year for such Southern gospel classics as "He's Still Workin' On Me", "Every Need Supplied" and "Master Of The Wind". In 1990 the group decided to retire and Candy began to travel with her evangelist husband Kent Christmas. Candy's solo debut was 1983's 'Candy Hemphill' for Heartwarming Records. A review in CCM magazine reported, "'Candy Hemphill' may be best appreciated by Southern gospel purists, not by listeners weaned on rock'n'roll." Her second album, 'Heart Of Fire', for Impact Records was a greater success with CCM reporting that it "alternates between uptempo and easy listening" while her next album 'Arms Of Love' (Greentree) was her most pop orientated project. In 1988 Candy joined Heirloom, a trio of country gospel singers in an imitation of the successful trio of Linda Ronstadt, Dolly Parton and Emmylou Harris who were hitting big in mainstream country. The other Heirloom members were Tanya Goodman-Sykes who, like Candy, had years of Southern gospel experience with The Happy Goodman Family, and Sheri Easter (who left Heirloom after a year and went on to find success with her husband Jeff Easter). Sheri's replacement in Heirloom was the Canadian-born country singer Barbara Fairchild who had once enjoyed a Top 10 mainstream country hit in 1973 with "Teddy Bear Song". Heirloom never achieved the breakthrough in either the mainstream or the CCM market though the first album by the group 'Heirloom' produced the single "There's Still Power In The Blood" which did well in the Southern Gospel charts. More Heirloom albums for Benson, 'Apples Of Gold' (1990), 'Uncommon Love' (1991), 'The Best Of Heirloom' (1993) and 'Hymns That Last Forever' (1995) followed. Tanya Goodman-Sykes remembered the Heirloom days fondly. She told CCM magazine, "We could never pass a mall without stopping and we always got lost on the road; basically every female stereotype you could imagine. It was lots of fun for awhile." In 1995 Bill Gaither called Candy asking her to come and sing with the reunited Hemphill Family for Bill & Gloria Gaither's Homecoming Friends' 'Let's Have A Revival' video and a year later Candy was asked to be part of the Gaither concert series. In 1997 Candy returned to her solo career recording the 'Fully Alive' album as Candy Christmas and in 1999 made 'No Turning Back'. At the time of the latter's release she told The Gospel Voice magazine, "I'm not a frustrated country singer or a frustrated rock'n'roll singer. I'm a gospel singer. It's the Gospel set to music. I take this calling very seriously. I was raised in church and so many times we take God for granted. The there came a time in my life that I knew that I needed a personal relationship with God. He's not a lifestyle - he's a friend." Another album, 'Watch Over Me', was released in 2003. Yet despite a supportive husband and the joy Candy found in bringing up her children Jasmine (today aged 21) and Nicholas (16), Candy began to suffer from ever increasing bouts of depression. Then in 2004 came a fresh challenge and ministry which lifted the depression from the award-winning singer. "I found that serving the poor and homeless gave me a new sense of purpose. I thought, 'I know how to cook. I'm a Louisiana girl. I can make jambalaya in a big pot as well as a small pot.'" With that, she began to feed the poor and homeless. "I realized that the biggest portion of them had no gloves, socks or coats. It was January, so we went to Walmart and Dollar General to buy scarves and coats. By the next week it began to grow, and it hasn't stopped. Some nights we'll have 500 people under that bridge." The Bridge Ministry is now a vital part of the city and much of what gets her up in the morning. "We feed the attendees at the beginning of the service," said Candy. "Then we invite them to stay for church under the bridge. We have sound, lights and chairs and we have a worship service. At the end of the evening, we give away brand new clothing, toiletries, groceries and a bicycle. Those who stay until after church are loaded up with stuff. It fills our hearts. There is no joy like walking away from the bridge and seeing these people with so much stuff they can hardly carry it. They often bring their friends with them the next week." Candy also founded the Food For Kids programme. Volunteers go every Friday and fill backpacks for underprivileged children in the Nashville area who are on free or assisted meal programmes. "I have a purpose. 36,000 snacks to school children last year!" she exclaimed with a glowing smile. "We get permission from parents to send grocery bags of snacks home for the weekend and they love it! On Mother's Day, the children were able to take jewelry and make-up items home to their moms. It enabled them to give something special to their mothers on this significant day." Continued Candy, "I have found purpose - to help the poor and take care of people who can't help themselves. I want to share the mercy God has put in my heart for people who have fallen on hard times and to express my love for them. I don't care if you're rich or poor, no one can resist love. We go in with no agenda, only with love, saying, 'We're not trying to sell you anything.' I don't care if they're prostitutes, addicts, whatever. . . I just want to love people into the Kingdom of God." That desire has resulted in 'On The Other Side', Candy's first album in seven years. Speaking about the album the singer said, "I wanted to get my message out - to stand on the rooftop and yell, 'Help me help these people!'" The lyrics found on the album, which was produced by Robb Tripp, are words Candy has already taken from the studio to the street over the past decade. One of the songs she recorded is the popular tune "Orphans Of God" which she made her own with an honest and organic approach, indicative of the streets on which she serves. She also re-recorded The Hemphills' ballad "Could I Wish", produced this time with a more "rootsy" approach and stripped-down style. She commented, "I was going for honesty. I'm not much of a fluff person anymore, after time under the bridge with helpless people scratching for survival and starving to death. You can feel that in some of the album's production and tone. I think when I first recorded this song, I was still wishing for 'mansions' as an up-and-coming artist. That's what success was back then. I understood the words as much as I could, but 'could I wish an easy life for me?' Yes, I could still wish. As all of us mature as Christians and as Christ is formed in us, the more we're going to have compassion and learn to love others, not because of their status in life but because of God's love in us." That love is celebrated in songs like "Since I Laid My Burdens Down", a song she sang in church as a little girl, and "Jesus On The Mainline", which the singer has slowed down with a more relaxed groove. "Climbing Up The Mountain" is a foot-stompin', black gospel-oriented tune while "Troubles Of This World" offers a soulful, R&B tinge from Candy. The song "Can You See The Clock" is dear to the singer and is a message she proclaims weekly. "We had a guy at The Bridge who wanted someone to hear his confession. 'I can't sleep,' he said, 'I can't live with myself.' Another man, who has been coming for six years, is the drunkest person I've ever met. He sits on the front row and weeps and sobs. He comes to prayer every week and can't forgive himself for things he has done. I can't be their judge. I think there's a special place in God's heart for people like that - truly sorry and repentant. My job is to feed them, showing them the love of Jesus. If they stay long enough I tell them, 'Jesus is the answer.' I can see fruits of my labours under the bridge. Sometimes God will give me a little view of a changed life. That is a real treasure." When she's not proclaiming this message to the inner-city's needy, Candy often travels around the country, speaking and singing in churches and at women's events. "I'll tell you this: I'm not depressed anymore. I made a decision. All of my life I'd been taught the Gospel of Jesus Christ, and I came to a place where I thought, 'Either it works or it doesn't,' so I started The Bridge Ministry. God has given me a grace and a mercy for people who can't help themselves. "They don't care if you're singing gospel music. They don't care if you're too country, too pop, whatever. Homeless people don't care what brand you are. They say, 'I'm dying of cocaine. Can you help me? The Gospel you're singing about, will it work for me?' God's Word says, 'Blessed is he who hungers and thirsts after righteousness; he shall be filled.'" I never realized you faced such tough physical challenges in life. My wife and I simply sat back and lapped up your ministry when you sang with the Gaither's. Today I caught you talking with Mark and realize you are serving our Living Savior by means of the Bridge ministry. We thank God for you. Bless you for all you do for the Lord you have a real talent God given I have just listened to you and David Phelps singing Jesus Saves he still does please pray for me I have a knee injury which I may have to have a knee replacement I pray for your ministry daily God bless you and your family. Candy, I just wanted to say that you above all singers touched my heart the most. I went to a small church in Tuscaloosa Alabama by the name of Double portion. You came with your family and sung. Your father told everyone that you were a black belt in karate. I wanted to talk to you, but felt you were way out of my league. I grew up in a boys home and never knew what a reL family was like. I still don't. I envied you but was never jealous of you. Even today, you...and your music moves me. I love you Candy. As a christian should love another. I wish I had spoken to you. You came out into the crowd and came close to where I was, but when I saw you I felt you wouldn't like me, so I never said anything. I just stood there with some other people and looked at you. You were fantasticly beautiful and i was worthless. At least thats how I have always felt. But thank you for not saying "What I THOUGHT you were thinking." You are atrue God send Candy Christmas Himphill. Just know that. We'll meet again in heaven. I wanr to say... I love you girl. But I really want to say I love you for being you. The girl that made Jesus shine thank you. And God bless. Bye bye. I loved listening to you and your parents sing a very long time ago. If I had had a girl her name would have been Lebreeska. I love it but I had 3 boys. I love to hear you sing. Utilize the seven spirits of God every day and there can be no depression. They are in 11th chapter of Isa. This is the mind of Christ and we are to take part of His nature. Hope this helps. God bless you. My husband and I met you and your family years ago at a Jim and Tammy 4th of July Celebration (PTL)Then later my mother and I met spoke with you in Gatlinbury or Pigeon Forge, Tennessee. A friend of mine gave me a book titled "Lebraska". I see you quite often on the Bill Gaithersburg Gospel Singing. I love your new hair style. Thirty years ago, I was in a beauty shop next door to a reseraunt and the Hemphill bus pulled in. All stepped out, my daughter (4-5) seen you went to jumping and screaming because of you. Because there was food next door, you came to me and asked if she could eat with you. She had little zipper pockets on her tennis-shoes so you or some of you had put pennies or dimes in those little pockets. She literally wore out "He'S 'Still Workiing on Me," Then a little later :"Master of the Wind." Candy and the ministry are a true blessing from God , Iwas homeless and this was the one thing I looked forward to every week. Thank you so so much!